Results will help to pin down the so-called "island of stability"
An international research team has succeeded in directly measuring the strength of shell effects in very heavy elements. The results provide information on the nuclear structure of superheavy elements, thus promising to enable improved predictions concerning the location and extension of the island of stability of superheavy elements. Indeed, it is expected that this group of elements will profit from enhanced stability due to shell effects, which endow them with long lifetimes. The exact location of this island is still a topic of intense discussions. For the present measurements, performed on several isotopes of the elements nobelium und lawrencium, the scientists utilized the Penning trap facility SHIPTRAP at the GSI Helmholtz Centre for Heavy Ion Research in Darmstadt. The results have been published in the renowned Science magazine. So-called superheavy elements owe their very existence exclusively to shell effects within the atomic nucleus. The building blocks of an atomic nucleus, protons and neutrons, organize themselves in shells. Certain "magic" configurations with completely filled shells render the protons and neutrons to be more strongly bound together. Without this stabilizing effect atomic nuclei of superheavy elements would disintegrate in a split second due to the strong repulsion between their many protons. Long-standing theoretical predictions suggest that in superheavy elements, filled proton and neutron shells will give rise to extraordinarily stable and hence long-lived nuclei: the "island of stability". Still, after decades of research, its exact location on the chart of nuclei is a topic of intense discussions and no consensus has yet been reached. While some theoretical models predict a magic proton number to be at element 114, others prefer element 120 or even 126. Another burning question is whether nuclei situated on the island will live "only" hundreds or maybe thousands or even millions of years. Anyway, all presently known superheavy elements were created in the laboratory and are shortlived. No superheavy elements have been found in nature yet. Precise information on the strength of shell effects that enhance binding energies of protons and neutrons for filled shells is a key ingredient for more accurate theoretical predictions. As the binding energy is directly related to the mass via Einstein's famous equation E=mc2, the weighing of nuclei provides access to the nuclear binding energies and thus the strength of the shell effects. With the ion-trap facility SHIPTRAP, presently the most precise balance for weighing the heaviest elements, a series of very heavy atomic nuclei in the region of the magic neutron number N=152 have now been weighed with utmost precision for the first time. The studies at hand focused on nobelium (element 102) and lawrencium (element 103). These elements do not exist in nature, so the scientists produced them at the GSI's particle accelerator facility and captured them in the SHIPTRAP. 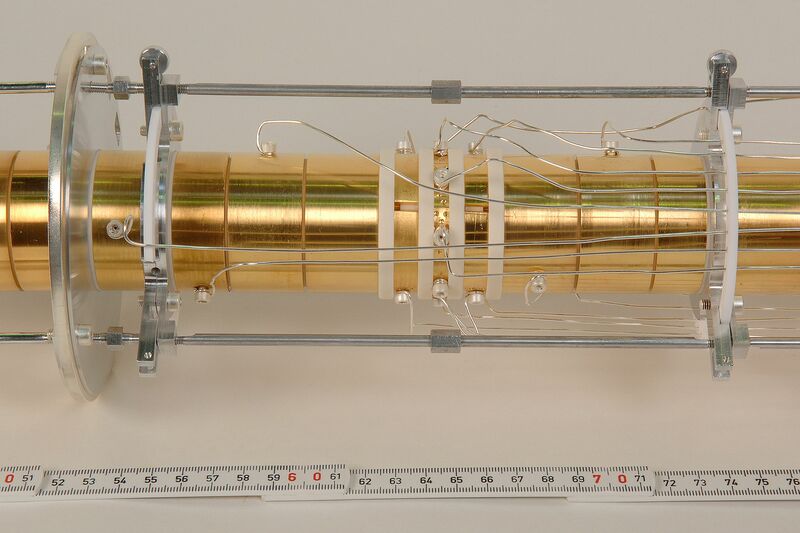 The measurements had to be performed with just a handful of atoms: for the isotope lawrencium-256 only about 50 could be studied during a measurement time of about four days. The new data will benchmark the best present models for the heaviest atomic nuclei and provide an important stepping stone to further refining the models. This will lead to more precise predictions on the location and extension of the island of stability of superheavy elements. The experiments were carried out by an international team led by scientists of GSI and the 2009 established Helmholtz Institute Mainz (HIM), a joint institution of the GSI Helmholtz Center for Heavy Ion Research, Darmstadt, and Johannes Gutenberg University Mainz (JGU), in collaboration with scientists from the universities of Giessen, Granada (Spain), Greifswald, Heidelberg, Mainz, Munich, and Padua (Italy), as well as the Max Planck Institute for Nuclear Physics Heidelberg and the PNPI St. Petersburg (Russia).